One of my weekly rituals in life is perusing various Disney blogs. In particular I enjoy photo updates which document the various goings on at Disney World, including changes and refurbishments. As our trip is getting closer and closer I recently realized: These changes / refurbs are going to affect MY TRIP! I know that seems simply ridiculous of me to say, but it takes a second to sink in. I've been getting very upset about the amount of construction work going on at WDW to the point of constant anxiety. The Magic Kingdom in particular is absolutely riddled with construction walls. Out of everything going on, the lengthy down time of The Mad Tea Party has me the most upset. Something about the manic spinning, bright colors, and wild music gets me in the "rope dropping" spirit. I know that I'm in the minority when it comes to actual enjoyment of the attraction...and yes, I too get nauseous on this attraction, but I doubt at this point that anyone could argue against the atmospheric contributions of the famous teacups. What attraction would you be most upset to miss on a trip due to refurbishment?? Join the discussion and let us know either on Twitter or on Facebook! Just missing seeing the teacups in action, without necessarily riding them, is a giant loss to any walk through the Magic Kingdom. They are just that much fun to simply watch. 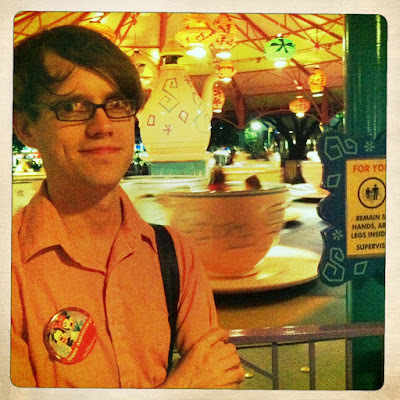 I went to the Magic Kingdom a few weeks ago and was so sad when I found the teacups closed! Unfortunately, my very favorite ride was closed as well: Splash Mountain! Of course, it didn't ruin my trip (and I don't think anything really could- any Disney Day is good enough for me! ), but it was a little disheartening for two of my favorite attractions to be closed at the same time.